One of the nice things about being a both a swim coach and former swimmer is that I have a perspective on swimming that was not available to me when I was a just a swimmer. Two things stand out for me as significantly different back in the 1970s as compared to now. Back then, swimmers just didn’t survive nearly as long as now. With very few exceptions, you were done swimming when you finished university, assuming you even lasted that long. It was almost unheard of to still be swimming in your mid-20s And this wasn’t because you had to work for a living and had no time for swimming; it was because of the training excesses of the time. At my peak I swam 13 practices a week, totalling 30 hours in the water. I can remember my longest practice being 15,000 m, and weekly totals were regularly over 100 km. But in addition to our swimming workouts we had up to 10 hours of dryland a week, including a daily requirement to do 500 “pulleys” (the equivalent of cords today). Our coach used to tell us that we had a day off, because we finished our 3-hour Sunday practice at noon, and didn’t swim again until 5:30 Monday morning. According to him, that’s a day! For those whose bodies were magically resilient enough to withstand this rigour, we improved at a tremendous rate. But this improvement came at a cost, and that cost was that our bodies gave out far earlier than today. Shoulder tendonitis was rampant, as was chronic over training and knee problems (breaststroke). Thankfully, our training regimes today are more scientific and balanced, but I still cringe when I hear of some clubs ramping up the distance. We had a fundamental understanding that Canada was among the elite swim countries in the world. This was more than an expectation, it was a reality. Here’s one way of explaining it. 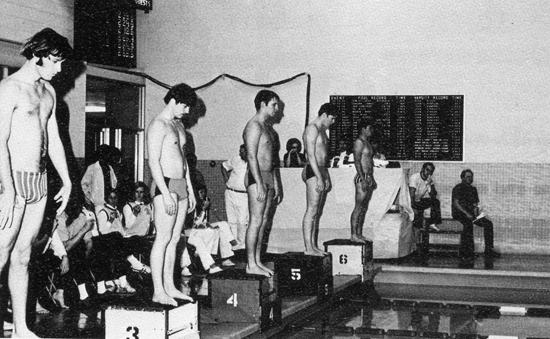 At the 1976 Montreal Olympics, the Canadian swim team won 2 silver and 6 bronze medals. Only the US, East Germany and Russian won more medals. Those are impressive stats by today’s standards. In fact, I had a teammate who placed 4th in our Olympic trials in the women’s 100 m backstroke and didn’t make the team, but would have easily made the US Olympic team. She had a good chance of making the Olympic final. We were good! But we were far more successful than even those totals would indicate. Officials from former East Germany have fully admitted to their massive doping program during the 70s, meaning that the incredibly successful East German team was cheating. If there was any sanity in the world, the doped East Germans would be stripped of their medals, with new medalists announced. For no apparent reason, this has not happened. But if it did, Canada would have won 3 gold, 7 silver and 3 bronze for an astounding total of 13 swim medals. Including a sweep of the Women’s 100 m Backstroke event! And now, in no particular order, here are other thoughts about swimming in the 70s. We had all of the usual ones, kickboards, pull buoys, paddles, etc. But we had some horrible ones that thankfully don’t see much use these days. By far the worst one in my mind was the pocket drag shirt. These shirts were worn while swimming, and had open pockets all over chest and back, with plastic inserts in each pocket that bowed open. They added so much resistance that speed was slowed enormously, and all the extra strain was taken on the shoulders. Wherever they appeared, shoulder tendonitis soon followed. Another one that I hated, and still makes a rare appearance these days is the tubing harness set up so that you have to swim hard and stay within certain area marked on the bottom of the pool. You swim as hard as you can and try to hold your position as long as you can. If you think watching a black line on the bottom is mind numbing, try watching a black line that isn’t moving! To me, it sucked every bit of joy out of swimming. With advanced materials out of the question, swim suits were tiny, made of a paper-type material, and not overly stretchable. Similar to today, we typically wore suits 4-6 sizes smaller than our training suits, except these things were tiny. I still cringe when I think about how tight they were. Hmmm, I guess this really hasn’t changed all that much after all. I’ve blogged about how goggles revolutionized swimming, and perhaps nothing said this more than swimming in the 70s. With swimmers training (stupidly) harder than ever before, age group records, national records, ALL records were up for grabs. We just got used to it. I hate to say it, but we thought we were just far superior as athletes than the swimmers before us. Now I know better. But that conceit might be a part of every new generation of swimmer. In any case, every big meet had a slew of new records. The best part is that when swimmers are not in awe of records, they don’t perceive there are limits to what can be done. There was a whole different attitude towards safety and responsibility. I can remember training in a 55-yard pool (and yes, there were records at all levels for this pool type) with a very shallow starting end (I recall it was 3-4 feet deep). When we had meets at this pool our coaches and the officials would tell all the swimmers not to dive deeply at all or we’d hit the bottom. Many times during the meet someone would dive too deep and come up with bleeding arms, or legs, or even faces. And we would get yelled at by the coaches and officials for diving too deep. It would never have occurred to us to blame someone else. We also regularly did extensive underwater repeats, and it wasn’t all that unusual for swimmers to just go unconscious. I personally saw this happen quite a few times. Coaches were quick to react, but still… I’m very happy that we now know more about the dangers of these shallow water blackouts. Back then, it was just considered something to watch out for. We swam differently than our present generation, and this was partly due to the rules, and partly due to the immaturity of our sport. As an example, for a period of about 10 years we were taught that for freestyle our hands should pull in an exaggerated S-shape. There were a lot of theories and “proofs” about how the hand could act as an airplane wing and provide lift during the pull. This was eventually disproven, but mainly through superior performance by swimmers with straight line pulls. We also didn’t know about underwater, so our turns consisted of pushing off (or diving) and then immediately swimming. Not even a hint of underwater. It never occurred to us. We had to touch the wall on our backs before doing a backstroke turn. If you want to have fun, get your kids today to try to do this quickly. The head was not allowed to go underwater during the breaststroke recovery. This was a much bigger deal than it sounds, as a portion of the head needed to be above the water at all times after the pullout, and this includes being above the bow wave in front of the head. Some swimmers took to wearing 2 caps, with extra air trapped in the second one. The other strange byproduct of this rule was it determined the size and shape of the top breaststrokers. You either needed to be incredibly light so that you stayed very high on the water, not unlike those water striders bugs that never seem to get wet, or you needed to be phenomenally strong to bull your way through the water. So the top breaststrokers tended to be either 13-14 year-old prepubescent girls, or much older and incredibly strong and bulky guys. Not a lot in between. Anybody else have any recollections of swimming in those years? Previous Post Swimming By the Numbers: The Unfairness of Short Course – Long Course Conversion Rates, especially for Backstrokers! Great topic! I’m sure in 10-20 yrs, we’ll look back and say the same about today’s training. Thanks for the walk down memory swimming lane. We also shaved our bodies, but wouldn’t dare touch the cheesy 70’s disco mustache (took so long to grow at 16!). I still feel like today’s backstrokers are “cheating” when they turn over for flip turns. All of my, our records were beaten many times over soon after we graduated high school, except for Jeff Fish (his real name) in his 1976 100 yd. breaststroke record that stood at least until 2014 (last time I visited my old high school). There were two factors, one, he swam a 21st century style breaststroke (how did he not get disqualified?) like 30 years before its time and two, his girlfriend was one of the two official timers (stopwatches, with minute and second hands). Another big difference I’ve seen is in the team spirit. Back then the best swimmers were on the high school swim team. Now, the best swimmers are in suburban private clubs, and the swim meets are very individualistic. The competitors don’t seem to care at all about team score, team standings, they are only focused on individual times, they may not cheer for any team mate, or only their best friends, if they notice. They pay so little attention to the meet other than their own events that they have to write their events and when they should get ready in sharpie on their arms or legs. I had a great coach who scheduled us against large powerhouse schools who would humiliate us with lopsided wins, so we learned how to lose. When we swam against smaller weaker schools, he would move us into not our best strokes and events so the meets would be exciting and close. He thus taught us how to both win and lose with grace and sportsmanship. To the extent that I’m a good man and a leader, I owe it to my high school swim coach. I couldn’t even finish a 100 meter butterfly any more..
California was different. There were lots of private clubs in the 1970’s.. The old novice system and then the AAU system. Shirley Bashasoff swam both in California and so did I. With modern techinques I would have swam both my breast and fly about 2 seconds faster. The real heavily yardage did’t come in until about 1973 when Mark Shubert coach Mission Viejo. High school times are usually pretty slow since most high schools don’t have year round swimmers. In fact the Great Gary Hall Sr, father of Gary Hall Jr held the 100 yard fly, 100 yard back and 200 yard IM at his high school until 2009 because his high school went from being mainly white and middle class to Latino and Asian and lower middle class. The kid that beat his records swam at Mission Viejo. When you think of it Michael Phelps best 100 meter fly time is only about 5 seconds faster than Mark Spitz’s 100 meter time. Most of the time Michael swims about 3 to 4 seconds faster than Mark did. In meter swims, times have not improved as much as short course because the underwaters helped short course. And, Mark Spitz swam with the same cheesy 70s disco mustache all of us idiot boys wore, which had to carry at least 2 kilos of water weight and as much drag as a cotton tee shirt. God, how did we ever think that was attractive? I was a breaststroker and I put on weight with years. I would have liked today’s rule and the one dolphin kick with the breastroke pull on the turns since I was also a butterflyer. I was trying to explain to my husband how we had to do shallow dives back in the 70’s. Racer’s dives didn’t go under the water with extra kicks as they do now. How do you explain the “cup” shape shallow dive that made that big POP on top of the water? From flip turns to stroke changes, I wonder how much time we could have shaved off our PR’s with today’s techniques. I’d like to know how they have changed how they treat the pool water now. The chlorine would eat through our suits and make them almost transparent. I’d go home from practice feeling ill from too much chlorine. Hi Kimberly, yes, things were certainly different back then. I remember that dives with pikes were quite popular. Dive out high, then pike in, then angle up right away. Horrible compared to today’s dives. Plus, as you said, the belly flop type dive. I’m sure that between underwater kicking, BK flip turns, head can go under in BR, wedges on the blocks, etc, we could have gone much faster. And training might not have been so stupid. Your comment about chlorine is very interesting. I’m not sure if they made suits differently back then, but the suits really did degrade badly. And since I started before goggles, I’d often be seeing halos for the first few hours of school. Good times! I don’t have to worry about green hair along with strawlike stick em texture and thank god for goggles- I am still sensitive to chlorine , now along with fabulous colourful suits from Funkita- I can have fun competing as an older Masters swimmer, however; it took forever to get rid of those awful 60-70’s swim strokes … grrrr! Yeah, in the USA, yards was derigeur- now, am used to metres. Things have changed for the better! 1) Women’s college teams had hardly any financial support until the late 70’s. I remember my community college mens team (El Camino) had two women on it, and I also remember one day I was late for the pool workout after our dryland portion, and as a penalty, the coach made me swim the 200 fly and 1000 free in the meet that evening with Golden West College. Shirley Babbashoff swam for the Golden West men’s team and she totally cleaned my clock in the 200 fly. 2) We swam races without goggles. For some reason, goggles of that time came off too easily on your start from the blocks. I remember trying to use goggles one time when I did the 1650 in a meet and some water got in my right eye and I had to swim the whole race with blurred vision in one eye. Tim, you are so right about problems with goggles. I mainly remember wearing them, but they hadn’t cared about comfort or tightness. Those things hurt! But it was still better than not wearing them. As for the women’s college team, I was lucky to go to U of Toronto, and the women’s team was on a par (sort of almost with the men’s team. Unusual for those days.